Lisa Blenkinsop, Fish-WIKS Ontario Master’s student from the University of Guelph, has been working with Nipissing First Nation since Fall 2014. In November 2015 Lisa assisted in organizing, and participated in, the “Stories from the Land” workshop at Nipissing First Nation. The workshop was initiated by Nipissing First Nation, and coordinated by Clint Couchie, Natural Resources Manager at Nipissing First Nation and Nipissing Community Liaison Coordinator for the Fish-WIKS project. Nicole Latulippe, Fish-WIKS PhD student from the University of Toronto, attended the workshop as an observer. The workshop was facilitated by Ryan McMahon, an Anishnaabe/Metis writer and comedian known for his “Red Man Laughing” podcast, and brought together Youth and Elders from the Nipissing First Nation with the goal of creating a space for inter-generational storytelling and knowledge transfer, as well as a digital documentary podcast to allow the workshop to be shared with the community. The workshop centered around fisheries and land-based knowledge within the community, and took place over three evenings and one weekend afternoon. 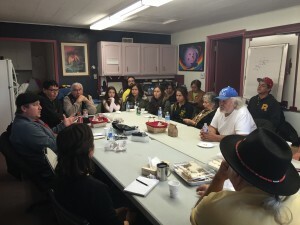 (Elders and youth at the "Stories from the Land" workshop held at Nipissing First Nation in November 2015). The first evening brought out Nipissing Youth (aged 14-29), the second evening Nipissing Elders (50+), and the final evening and afternoon brought Youth and Elders together to share their knowledge and experiences in the community. Overall, 25 community members participated over the four days of the workshop, including 17 Youth and 8 Elders. The workshop relates directly to Lisa’s research on intergenerational knowledge transfer, and the recorded data and observations will contribute to Lisa’s Master’s research and thesis. For the Nipissing community, the audio archives and transcripts of the workshops will be made available through the community library.